And so we come to part three of our Monster Update! This will be the final part for today, but I do have other stuff lined up for the coming week. In this blog update: Greeks. If you read my Crisis 2013 show report, you’ll have gathered that I have come into possession of nearly a hundred hoplites in a rather haphazard way. I couldn’t resist building and painting some test models, so here we go. 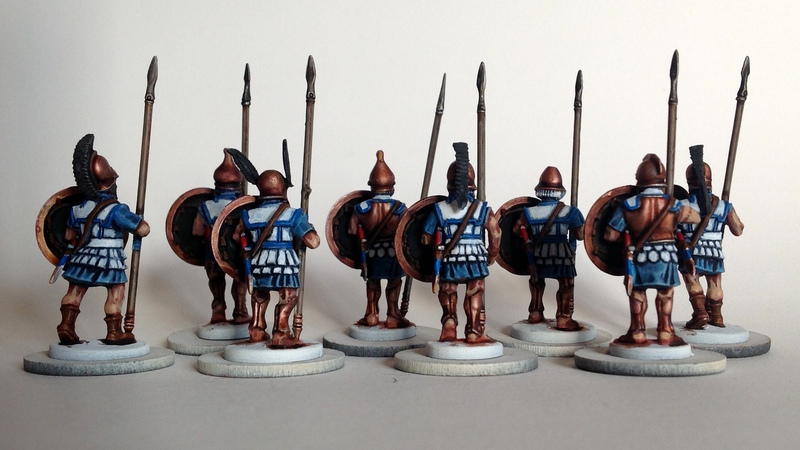 A mix of the (altogether very similar) Athenian and Mercenary Hoplites kits by Victrix. I have to say, I do like these kits, even though there are a few flaws. First off: why four different kits (Athenians, Spartans, Thebans and mercenaries) for what amounts to, in the end, small differences in headdress and accessories? Doesn’t make much business sense to me; and the right honourable Dave Thomas had a huge stack of Thebans on discount at Crisis 2013 and not a single of the other types, for instance. Another problem is that some of the bodies have their shield arms attached, and the hands on those shield arms are much bigger than those on the separate weapon arms. A nasty rendering problem, but not unforgivable as the shields cover it up. And other than that, the kit is excellent, with particularly well-rendered detail on the linothorax armour and a wide variety of poses you can achieve. Take a look at the left and right shoulders of these models and you’ll see I messed this up spectacularly. I decided to try out some new approaches to painting on these models. They were undercoated white, and I basecoated the cloth areas in lothern blue before applying a drakenhof nightshade wash all over. I then painted the metal bits in runefang steel; the iron bits were washed nuln oil and agrax earthshade, which is fairly standard, but the bronze deserves special mention. I used successive washes of seraphim sepia, fuegan orange and druchii violet. This is the first time I’ve used fuegan orange, it’s a rather strong dark orange wash. I can’t see myself using it quite often, but it worked out well on this bronze. Moving on, the skin, wood and leather were painted as per usual. The armour was highlighted with ceramite white while its edges were picked out in caledor sky. This blue was applied to the shield, too. The shields will definitely receive decoration; a sheet of waterslide transfers is currently in the mail. I’ll show you the results once I’ve got an entire 24-strong unit painted and based. This project will probably be put on ice for quite some time, but at least my hoplite fixture was sated (I’ve been playing a lot of Total War: Rome II lately, you see). 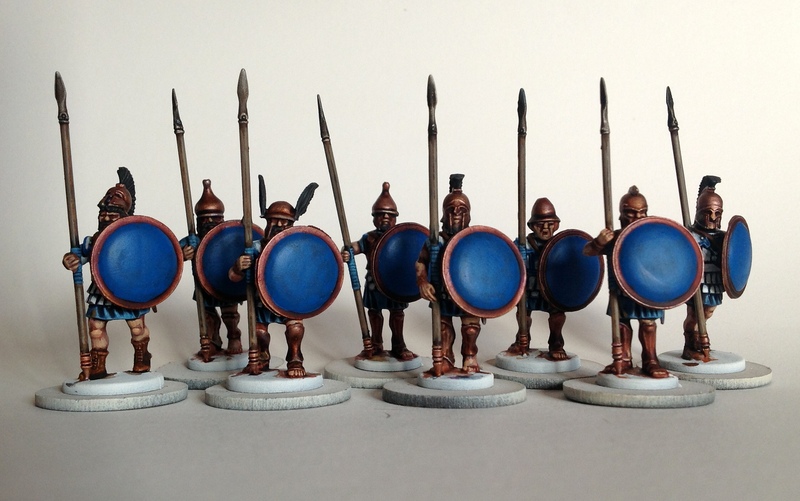 With the two 48-strong Victrix kits I’ve got enough hoplites to build four units, which is enough for a well-sized division in Hail Caesar, and I might be ready to pick up a command model and some peltasts at Crisis 2014. We’ll see how it goes!